Hi everyone! 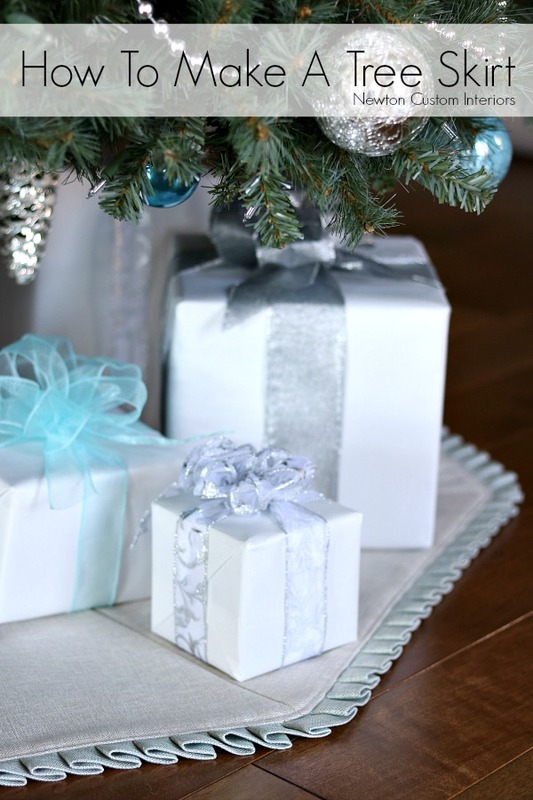 For today’s post, I’m sharing how to make a tree skirt. I know, it seems too early, but I wanted to give all of you some time to make this great tree skirt before you put your tree up! And no, I don’t have my tree up already, these are pictures from last year’s tree! There are a couple of details that I especially love about this tree skirt. The first is the knife-pleat ruffle around the outer edge. It’s a detail that shows even if the rest of the tree skirt is covered with presents! I also love the “frogs” with buttons that close the tree skirt. You could also switch out the “frogs” and make ties to close the tree skirt if you prefer. *I used a 1/2″ seam allowance. 2. With right sides together, sew 8 pieces together leaving the last two not sewn together. Iron seams open. 4. Sew the finished knife-pleat ruffle to the right side of the outside edge of the tree skirt. 5. 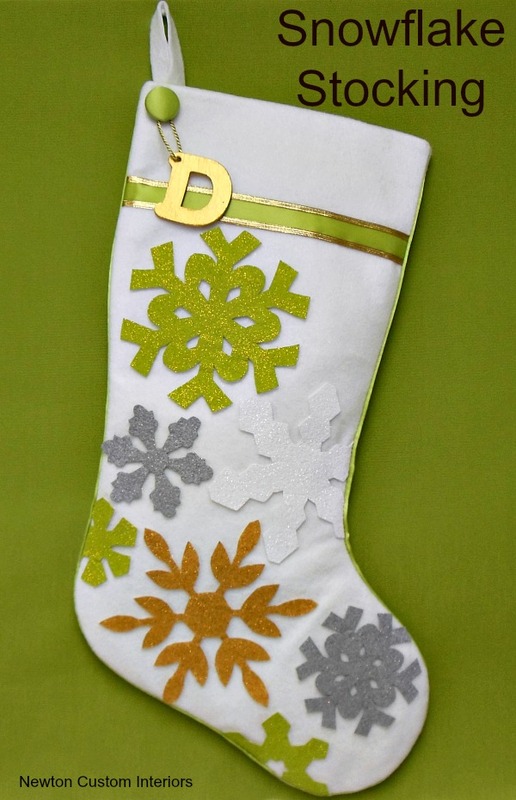 Lay the skirt right side down onto the lining or fabric that will be the reverse side of the tree skirt. Cut out lining using the skirt as the pattern. 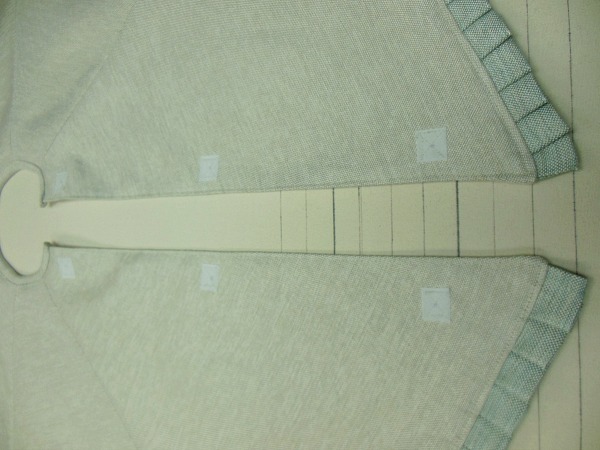 Pin both layers together, and sew the front and back sides together around the outer edge and the side opening. Do not sew the small hole in the center. 6. Turn right side out and iron. 7. Top stitch the outer edge. 8. 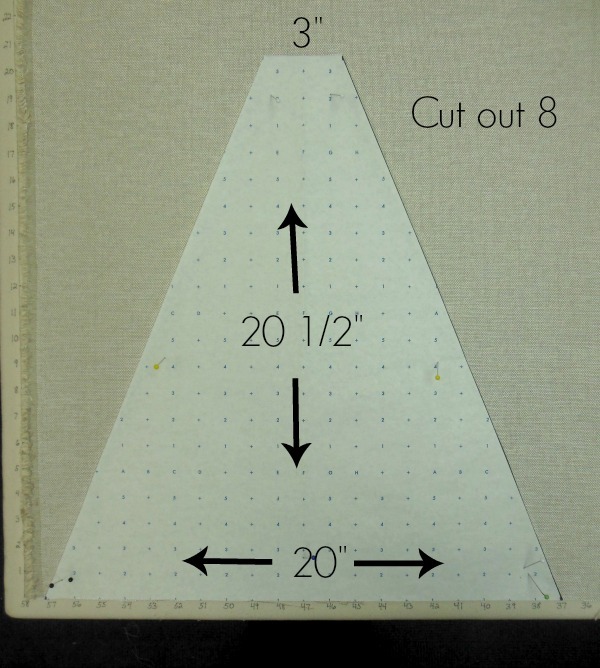 To make the binding for the center whole, cut a strip of fabric that is 2 1/2″ x 30″. Iron in half along the length with wrong sides together. Serge the two long sides together, and turn under the short sides. Hand sew the short sides together. 9. 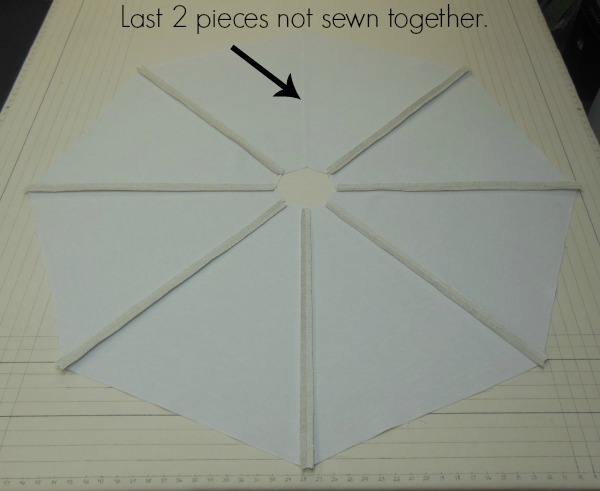 Sew the binding strip to the wrong side of the center hole. 10. Turn binding toward the front side and top stitch to the front side. 11. Make 3 “frogs” by cutting out 6 pieces of fabric, sewing each pair together and turning right side out. They can be any shape you want. The finished size of mine are 2″ x 4″. 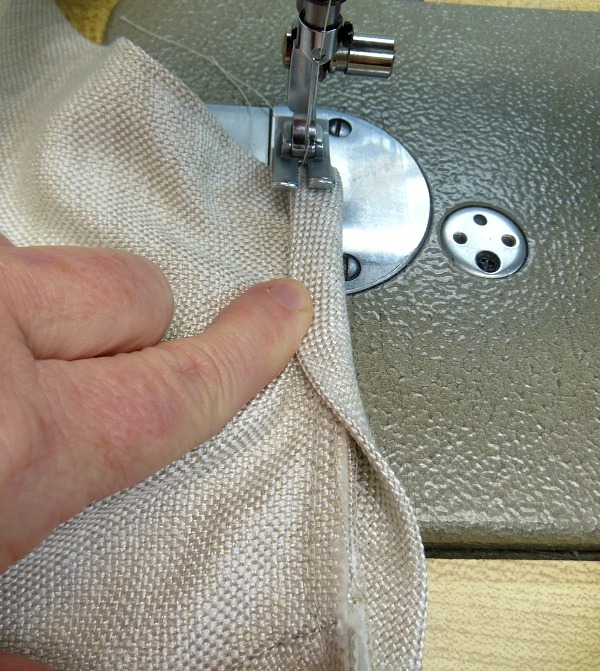 Turn raw openings under and top stitch around all edges of the “frog”. 12. Sew 2 small pieces of the loop tape to the wrong sides of each “frog”. 13. Sew loop tape to the right side of the skirt along each side opening at the top, middle and bottom of the opening. 14. 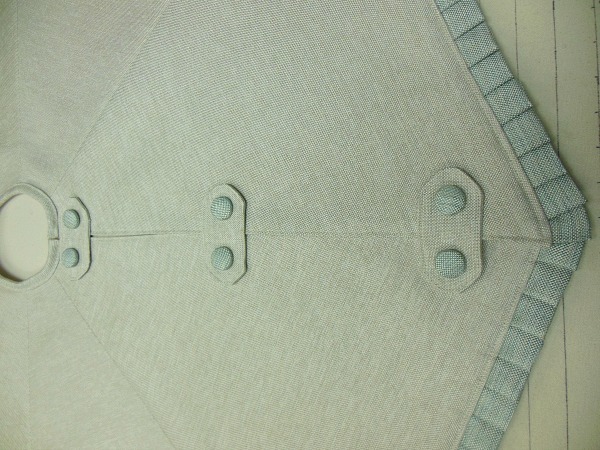 (Optional step) Sew buttons on each end of right side of each “frog”. 15. 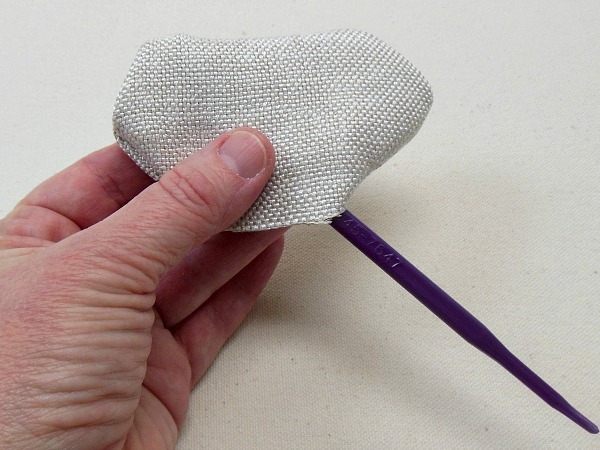 Connect frogs to to skirt using the hook and loop tape. You’re finished! When you’re ready to place the tree skirt around the tree, just undo one side of each “frog” and then reconnect the hook and loop tapes. I hope you’ve enjoyed this how to make a tree skirt tutorial! Thanks Lorraine! 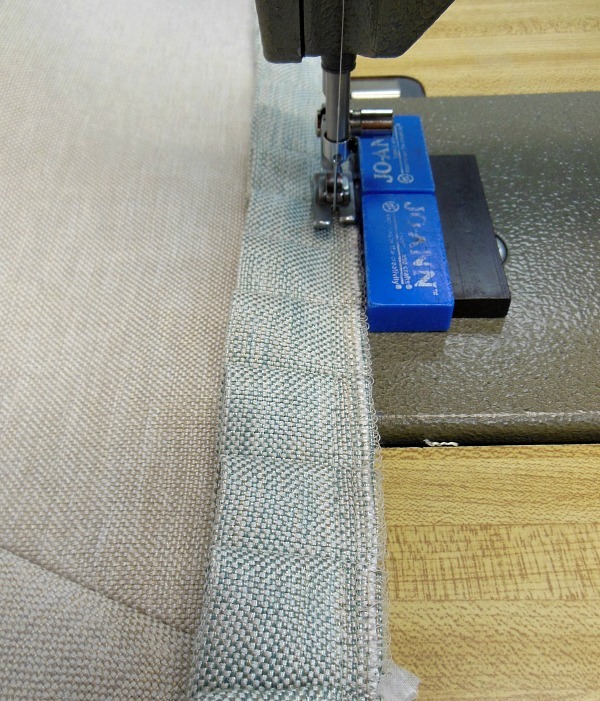 I use a 1/2″ seam allowance. I have added that important info to the post! Thanks! That is just beautiful! I love the fabric. Can you share where you got it? Thanks Hannah! I bought the fabrics from Greenhouse Fabrics. 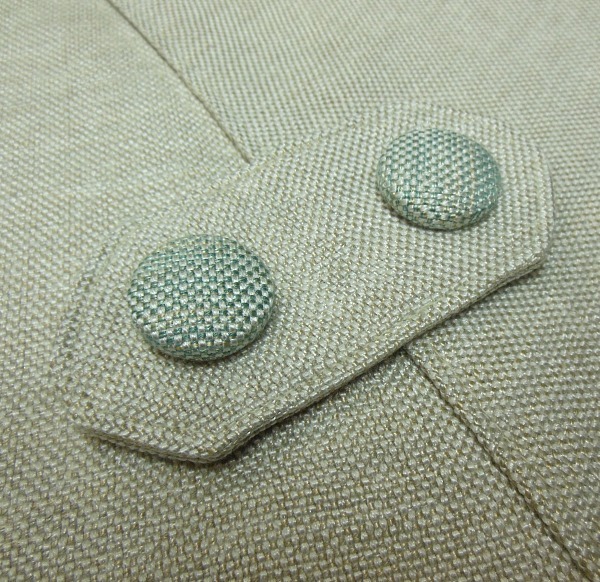 Can you share a specific link to the fabric please – I’m in England, so can’t get anything from your supplier – hoping to find something similar over here. Melanie, sorry, the only source I have is my wholesale supplier. 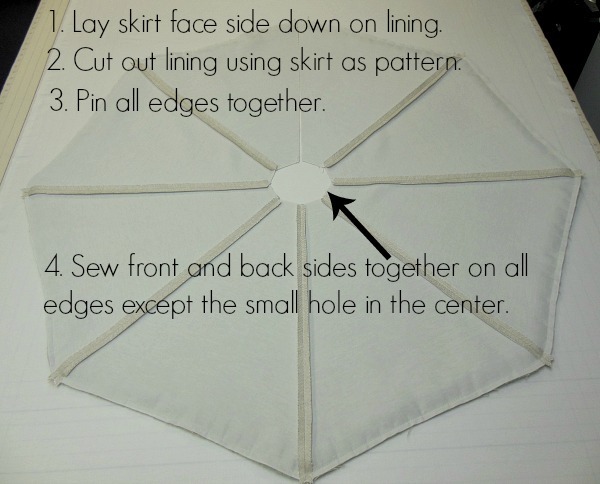 Thank you so much for this tutorial – i have been looking for something that will help me since I have a fabric that has a border print that i did not want to lose doing it as a round. Barb, I’m so glad the tutorial was helpful! Good luck with your project! 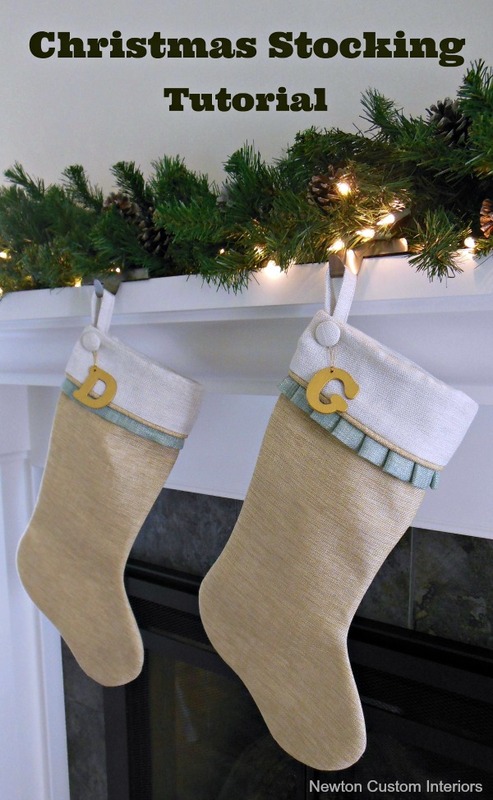 Hiya, I’m going to try to make this this year and wondered if you could tell me what this type of fabric is called? It looks more substantial than the cotton etc. 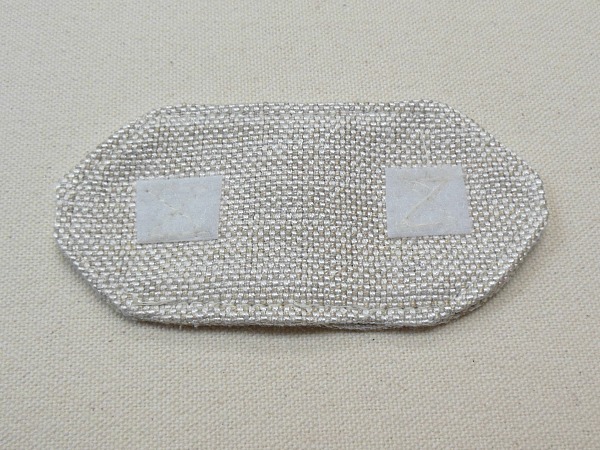 I was looking at and I’d like to use a similar fabric in my project but I’m not sure what this is called. Thanks for the great tutorial, gorgeous and simple! Thanks Christina! This is a decorator fabric, so it’s much thicker than a cotton quilting fabric. 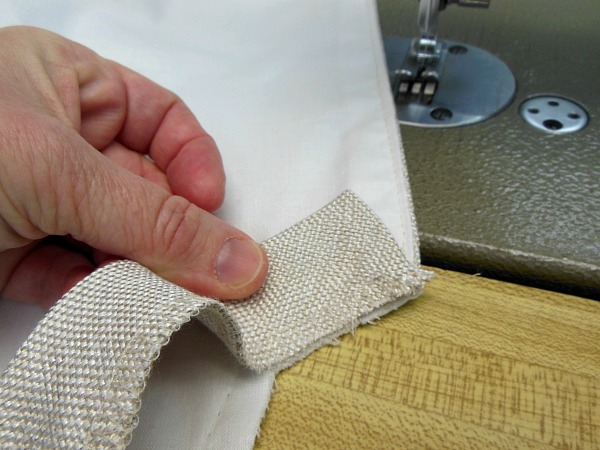 Decorator fabrics are usually 54″ wide instead of 45″, and more expensive. I bought these fabrics 3 years ago from Greenhouse Fabrics, which is a company I use to buy decorator fabrics for my clients. Love all the tailored details on this tree skirt. Thank you such great directions. I just finished making the Christmas tree skirt. It looks amazing. Thanks for the tutorial…. Yay! I love hearing that! I’m so glad the tutorial was helpful! 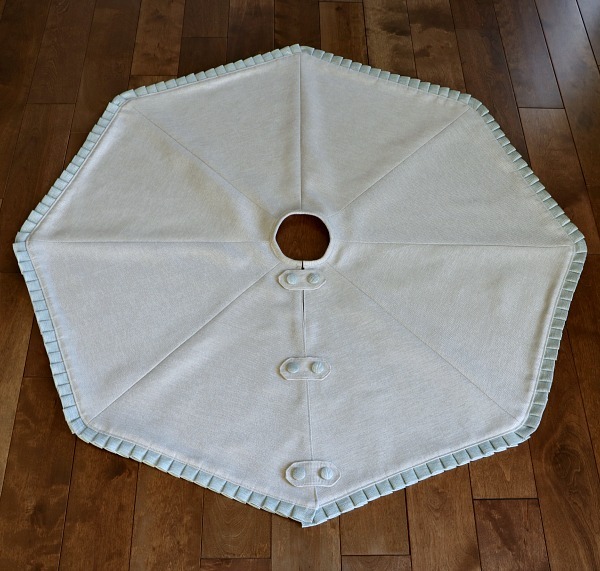 What are the finished dimensions of the tree skirt? This is perfect! I love the fabric you chose. Great tutorial. Thank you so much. I love this tree skirt and plan to make it for our new tree. The problem I’m having is our tree is huge so we need a skirt that is at least 72inches from edge to edge(36inches from center to edge). How do I scale the wedges for the larger size? Alicia, I would do a mock up to see how big the wedge pieces need to be. I’ve only made the tree skirt this size. Did you end up figuring out how to make the tre skirt larger? I also want one larger than 45×45! Thanks Mona! Good luck with your tree skirt! How big was the piece of cardboard you used to make your knife pleats? 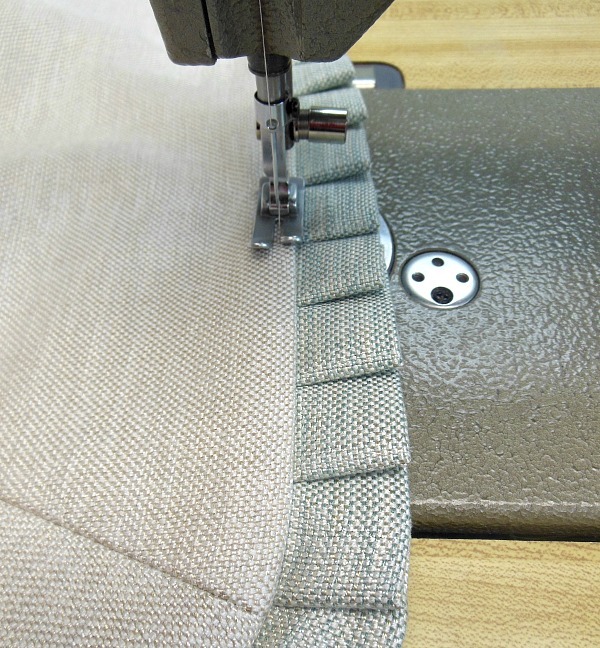 Do you find narrower pleats are easier to ease around the corners? Meg, you can make the cardboard whatever size you want. Mine was probably 3/4″ to 1″ wide. I think you have to really ease in any size of knife-pleat ruffle around corners.